With pictures! Check it out. I’m parsing results. I’ll have a lot more information shortly, and I’ll have a race report coming, and stats and all. But here’s the deal. This year I felt pretty good, and finished 20.96% back from the finisher. Last year, I finished 22.67% back. This year, I squeaked in to the Elite Wave by less than two seconds, in 200th place exactly! Last year, I was in 192nd. And if I’d finished last year in the same percent back as this year, I would have been in 172nd. The Elite Wave was competitive this year, especially the slower half of it. Last year, there were 57 Elite qualifiers from other waves. 54 from Wave 1 and three from Wave 2. This year, there were just 29: 27 from Wave 1, and one each from Waves 2 and 5. Yes, 5. And last year, there were 180 Elite Wave starters. This year, by my count, there were 211. I didn’t get passed by any Wave 1 skiers (which I did last year), I finished in front of more women, and I placed lower. Here’s a chart! What does this show us? It shows, for the top 300 places, the percent back in 2011 and 2012. For the first 100 finishers or so, there wasn’t much different between the years. 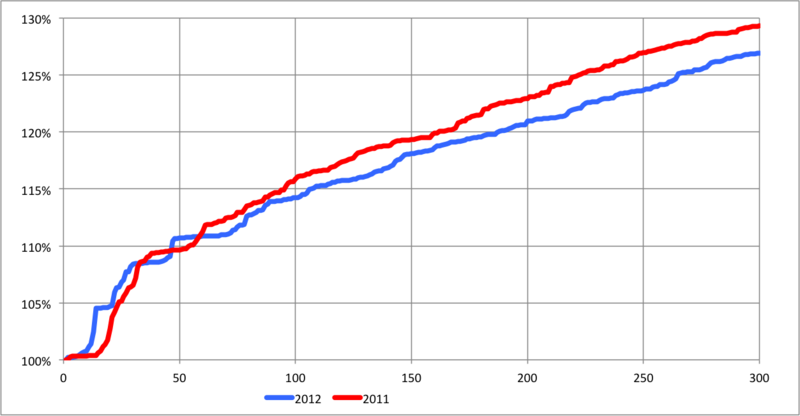 However, from 100 to 200, any given place in 2012 was significantly faster than in 2011. Take, for instance, 137th place. In 2012, this finisher was 16.6% back from the winner. In 2011, the finisher was 18.75% back. In 2011, 16.6% back would have been good 111th place—26 places better. Let’s look at 200th place—the last Elite Wave qualifier (that’s me!). This year, I finished 20.96% back. Last year, in 192nd place, I was 22.67% back and the 200th finisher was 22.95% back. And if I’d finished 20.96% back in 2011, I would have been in 172nd place, 28 spots better. So I got lucky but I guess I kind of had a decent race. And I better train better this summer. I’m tired of being right on the cusp. So, the last time the Birkie had snow issues (and not just potential snow issues like this year) was in 2007. The week after the Birkie, Minneapolis and Eau Clare each recorded 21 inches of snow with Duluth seeing 36 inches, with two feet of snowpack which lasted most of the month. Well, it may happen again. A light-to-moderate snowstorm is hitting the Northwoods today, mostly from Duluth north. Midweek, a monster of a storm will hit Minnesota, with a good chance of 1 to 2 feet of snow from the Twin Cities to Hayward. Snows may then spread east, and the western mountains may get hit as well. Winter is coming, just a couple of months too late. But the Birkie was perfect. Reports coming soon. I’ve got the fever. I flew out last night with a few other Birkie skiers and the fever was palpable on the plane. Waxing my skis the night before? Fever. Light snow in the Cities? Fever. Seeing the forecast for Hayward coming in a little cooler than predicted (and thus justifying my “hey let’s not bring a warmer wax” decision)? Fever. Oh, and I’m only responsible for about half the #Birkiefever tweets on Twitter. The only cure? More cowbell—and some skiing. Oh, also, how lucky are we? If you look at the snow depth histories for Minnesota, there was more snow on the ground in 2007 (shortened), 2002 (ended shy of the lake) and 2000 (canceled). And yet, it sounds like conditions should be pretty close to perfect. I won’t call it a miracle Birkie. But it’s damn close. Flex and grind. Old and cold. These are my answers to the frequen question of “what’s the wax?” The first is: “flex and grind.” This year, like most, you want a medium flexed ski with a fine grind. Why? Even when everyone thinks there are going to be hardpack conditions, like last year, the Birkie tills up the trail so it’s silky-smooth and very pliable, and not something where you’ll want stiff skis. And grind, well, much like last year it is going to be a tilled mix of old, transformed snow and new powder. It should be fast and pretty dry. Which brings me to old and cold. The Birkie snow is usually old and often older and drier. While it may be a bit more moist this year, it will probably still fit the bill. The last three years have started at 15 or below (or, last year, 15 below) and it looks like this year will be no exception. The model output statistics, which better show temperatures near the surface, are hinting colder than the models, and a bit of clearing and calm winds could drop the mercury Friday night. By 8:20 on Saturday, the sun could be rising above single-digit temperatures. What does this mean? It means good things. It means that the trail is in solid shape and can be tilled up overnight in to silky-smooth goodness. It also means that the race organizers are expecting cool-but-not-cold conditions overnight (race time temperature probably of 10 to 15), so they want to put down classic tracks in the afternoon to set overnight. But, considering what the winter’s been like, it’s going to be a good Birkie. Oh, and then there might be a foot of snow on Sunday. Good thing no one is trying to fly out that day. Last night, I was all ready to post a Debbie Downer weather speculation report, with models showing lower snow totals and only a few days left before the race. But then I decided to exercise phase three of Birkie training (phase two was get food poisoning / norovirus two weeks before the race, not one; phase three is get a lot of sleep the week before race day) and go to sleep. And overnight, well, news has become better. Oh, and recent trail reports make it sounds like even without new snow it won’t be an icy mess (well other than a few choice hills). But with a few inches of snow, it might take a lemon of a winter and make pretty good yellow gatorade. As for race-time temperatures, it looks cool—below 20 but above 0—and the models are bouncing back and forth between clear conditions and light snow. However, I am going to go out on a limb and say that it is going to be warmer than last year. Of course, it was -11 last year, so that’s not a high bar. I always make sure, when I register for the Birkie, to check my skier confirmation, because the Birkie has, from time to time, screwed up and put people in the wrong waves. (And who can blame, them, they only have a few thousand people to keep track of.) But skier confirmation is always validated with a birth date, so you can’t just look up any old skier to see their wave. Right? Well, not quite. If you stroll over to the media section, the Birkie is happy to help any of you aspiring journalists out there find people to talk to about the Birkie. (Of course, if you wrote about the race in the Washington Post and want to find out who made the jump from the second wave to elite, it’s probably best to hit up our statistics section—and it helps that I know the top two guys in that category.) But it’s also nice, because you can search for Birkie skiers by name, ZIP code, really anything. For instance, if I search “Ari” I find two Aris, two Arins and an Aris in the race. How many, say, Oklahomans are in the race? (One, Jakob, just you.) Let’s say you live away from Birkieland and want to find local skiers. Easy: enter the first three digits of your ZIP code and it will find people from all those ZIPs. Maybe I’ll have a Birkie party some time out east. With less than ten days to go, we know, well, not that much. Hopefully models will pan out and we’ll see a few inches of snow next week. And hopefully the later forecasts for race day will be for, well, not rain. But there’s not too much model consensus yet, and anything is possible. Best case scenario: 3-6″ of snow early next week followed by cold temperatures. Worst? No snow, and warm rain.